Would you stand in line for 5 hours for 10oz of beer? Every year around Valentine’s Day, 4th Street in Santa Rosa, California is the scene of a bunch of crazy people beer lovers waiting in line for a chance to taste the current batch of a beer called Pliny the Younger. At peak times the wait to get in the door can be over five hours. Each day a certain amount of the beer is allotted for drinking in an effort to make the brewed beer last for the two week period it is offered. This past weekend some friends and I braved the crowds for a taste of this very special beer. Why is it special? It is very expensive and time consuming to make so the brewers at Russian River Brewery decide to only make it once a year. And, people think it’s tasty. Is it worth a five hour wait? You have to decide that. But it is the number two rated beer on Beer Advocate, the spot for all things beer review and ranking in the US and Canada. The release of Pliny the Younger coincides with SF Beer Week, a 10 day celebration of beer in the Bay Area. Breweries and restaurants around the Bay have many events planned. So if you’re into beer, this is your week and you better find an event that suits your fancy. Pliny the Younger runs through February 14, 2013, then its gone ’til 2014. 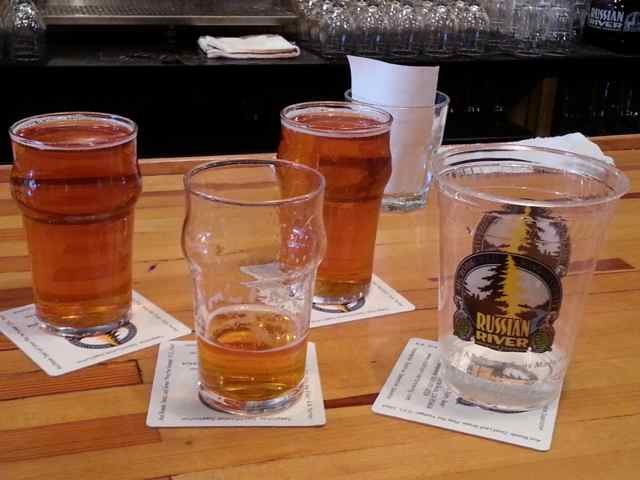 Pliny the Elder, the Brewery’s flagship beer, is on tap year round. If you go, get both and do a little taste test. I highly recommend the beer bites with spinach and mushrooms.